Tuber productivity varies between varieties, but you'll harvest 6 to 25 tubers for each tuber you plant. 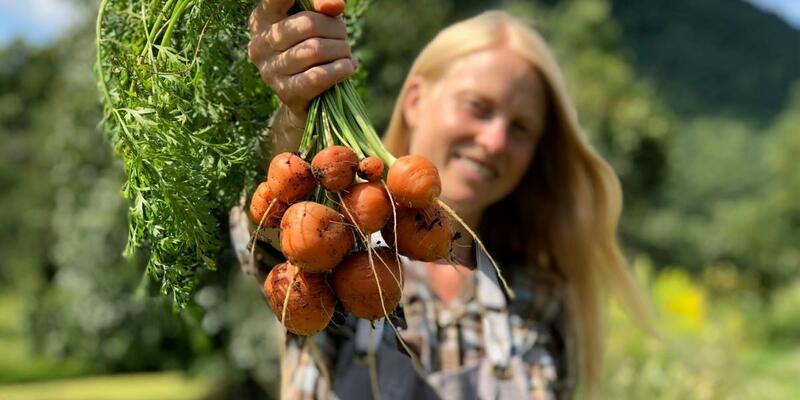 Not all will have full eyes allowing them to grow a stem next spring, but you'll easily harvest more than you planted, and likely a lot more. Last week, dividing our dahlias, I had 18 perfect tubers to save from one single plant. If I get 6 from other varieties, I'm psyched. The variation is part of the fun. 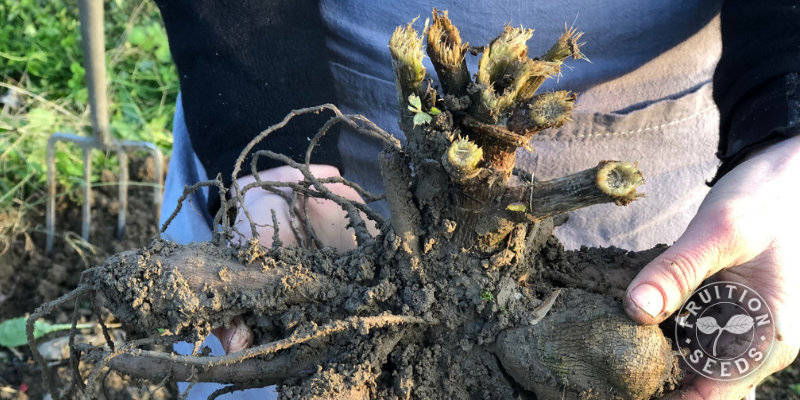 It's ideal to harvest and store dahlia tubers that have gone into dormancy, so they're not shocked by the transition of summer growth to winter storage. Two weeks after your first frost is the ideal time to harvest them: they're well into dormancy yet haven't been harmed by the cold. It's often cold and blustery, so do your best to choose a day that suits your sanity. Just before digging your tubers, trim each stem back most of the way to the ground. We like to leave five to six inches of the main stem so we have a 'handle' to hold as we lift and rinse them. Dahlia stems, like straws, are hollow, making them quickly susceptible to rot. Which is all to say, don't pre-emptively trim stems before you're prepared to dig. Dahlia stems are hollow and quickly rot when cut, so only cut just before you dig. If you have a choice (and often you don't), dig your dahlias when it's nice and warm (at least in a relative sense), when the soil is not totally wet. Since it's deep into fall when we harvest here in Zone 5, the ground is often wetter than we'd like. But the soil isn't likely to dry out until May, so we do the best we can. A digging fork is infinitely more effective than a shovel, if you've got one. Either way, be sure to give your dahlias a wide berth. Each variety is unique: Some grow down, others grow out and some grow waaaaay out. Each tuber is attached to the central stem, or 'neck.' Especially as you begin to dig a new variety, dig in a wide radius so you break as few tubers and necks as possible. Leave as much soil as you can in the garden, but resist shaking to protect the delicate necks. Once lifted, loosen the soil that is easily left in your garden. Your goal is to break as few necks as possible, so resist the instinct to shake them. Use your fingers to ply soil away from the tubers. We often use the dahlia stems themselves to release more soil, especially when it's cold and wet. Gently tuck your dahlia tubers into a tote or wheelbarrow, as if you were handling eggs, bringing them to their next step in the process. Before we go on, you have a choice to make: Divide now, in the spring or not at all. You'll likely get more tubers that you would if you divided in spring, since the eyes are much more visible. They're that much easier to cut, since they're fresh, as well. You'll likely get less tubers to re-plant, because the eyes will be so receded by winter's dormancy. Also, cutting dahlias that have survived the winter is like cutting leather. I have friends who simply quarter them in spring and that satisfies them greatly. If you don't divide your dahlias in fall, lift each plant and remove all extraneous soil from the tubers in the garden. Put them, fully intact, in a fully closed plastic bag and store them in the coolest, darkest place in your home that won't freeze. Always an option, and it's simple enough. You won't be able to propagate nearly as many new plants, but if you don't need many this may be the easiest choice. Pretend you're washing fresh eggs, delicate and fragile. Protecting the necks of each tuber is paramount. That being said, your garden hose on 'jet' is quite ideal to rinse them. Resist shaking them and handle them as little as possible. Washing them right in the grass by your compost is great; we spray them on a mesh metal table adjacent our compost. 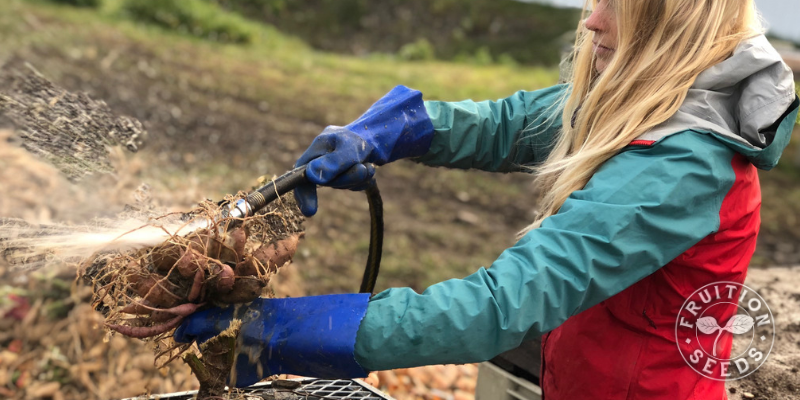 Your goal is to clean your tubers as thoroughly as you possibly can, making the dividing that much easier. Some varieties clean more quickly than others; gentle patience is one of the key virtues of digging and storing dahlias. Wash your dahlia tubers as you would eggs, protecting each fragile neck. Look at that tuber with the glorious cluster of eyes! 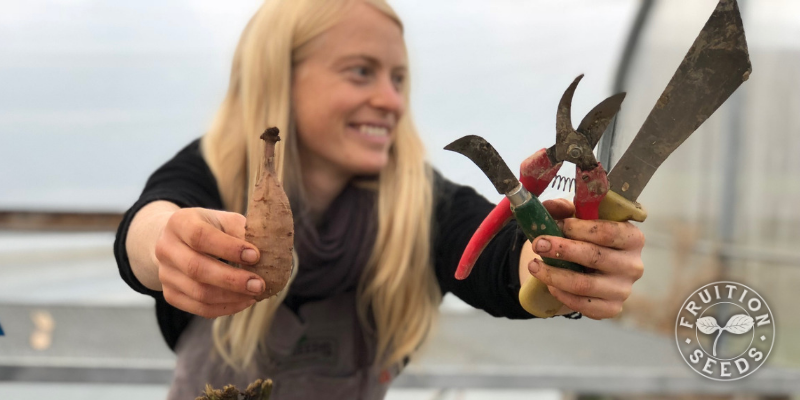 A hooked dahlia or hawks knife is an essential tool for easy tuber division. Dividing dahlias is a marvelous puzzle. Crosswords and sudoku are not fun for me, but boy, a wheelbarrow full of dahlias to divide brilliantly is just the kind of problem I love to solve. Without such an eye, your tuber will grow only roots, but not a shoot to grow up, forming leaves and blossoms. The tuber on the right is too narrow, it will most likely desiccate in storage. The middle tuber has no neck and no eye, so it won't grow shoots next spring. The tuber on the left is absolutely perfect, with plenty of eyes at the end of a strong neck. Start slow. Dahlia division is not to be rushed. 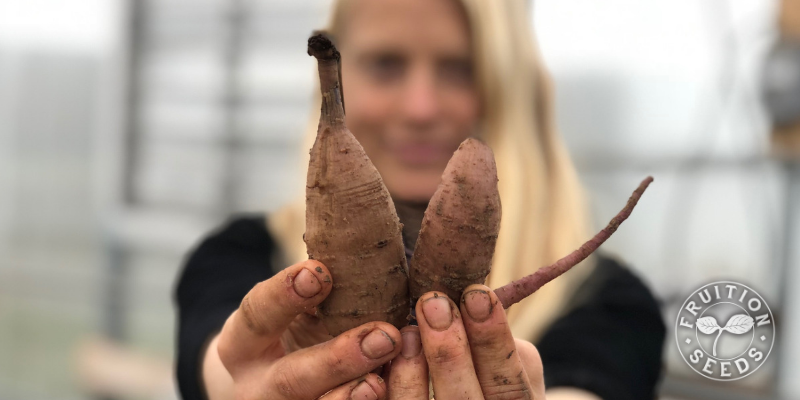 Different varieties, with their unique tuber architecture and arrangement, are handled differently. Some varieties I mostly use my shears; others I rarely put down my dahlia knife. Learning the separate genius of each tool is part of the fun. Keeping your tools sharp and staying curious are the only imperatives. 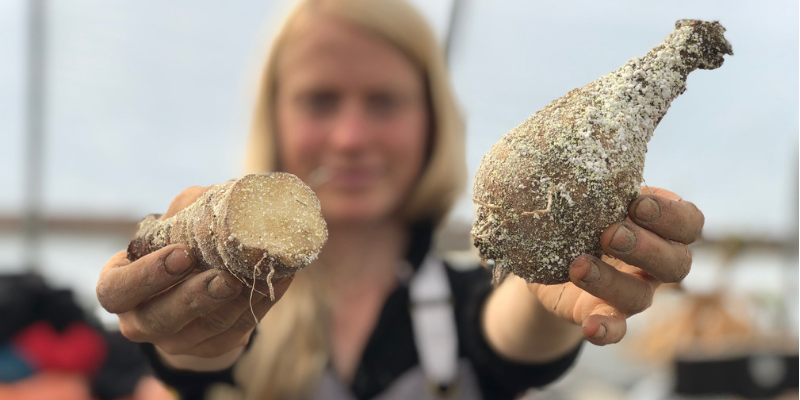 Once we divide all our tubers of a particular variety, we dip them into a bucket of powdered sulfur and vermiculite, providing an organic antifungal coat to prevent rot in storage. A spare dusting is quite ideal. Dipping freshly divided dahlia tubers in vermiculite + powdered sulfur is a great organic approach to defying rot over the winter. Tuck each tuber in a box with peat moss. It's important that the box be fairly air-tight; we line our open-sided bins with plastic to ensure there is minimal moisture loss. Next, put down a one-inch layer of peat moss. Here I'd like to add that I wish we could find a material other than peat moss for this step. Once we do, you'll know! In the meantime, we use the same peat moss for many seasons, using it only for dahlia storage. Be sure it is very dry, though not bone dry. 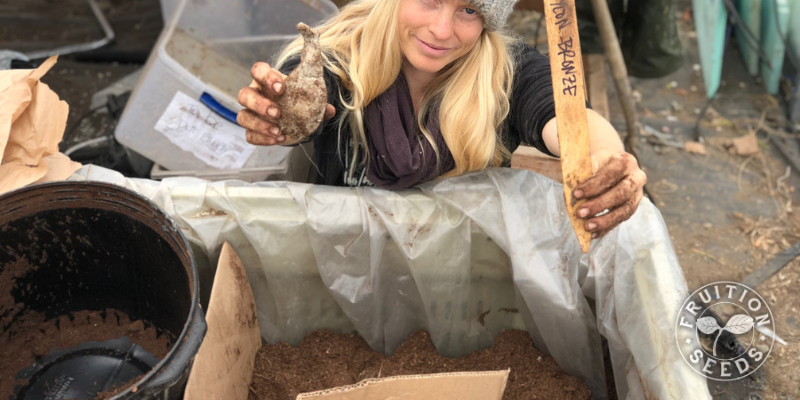 On your one-inch layer of peat moss, lay your tubers so there at least an inch of space between each one. It's important they don't touch, so if one begins to rot it won't spoil the rest. Keep adding peat moss, about an inch (enough to completely cover the last layer of tubers) until you've covered them all. Many boxes will store your dahlias well. Just be sure to not have them be too moist or touching. Label your box, inside and out. Rather than covering the top of the box with un-breathable plastic, tuck newsprint so it maintains moisture but is still breathable. Friends, it is essential to check in with your dahlias over the winter, making sure they're neither too dry or too moist. Stay tuned for a blog later this winter sharing our secrets! We check in each month. At the very least, check them once. 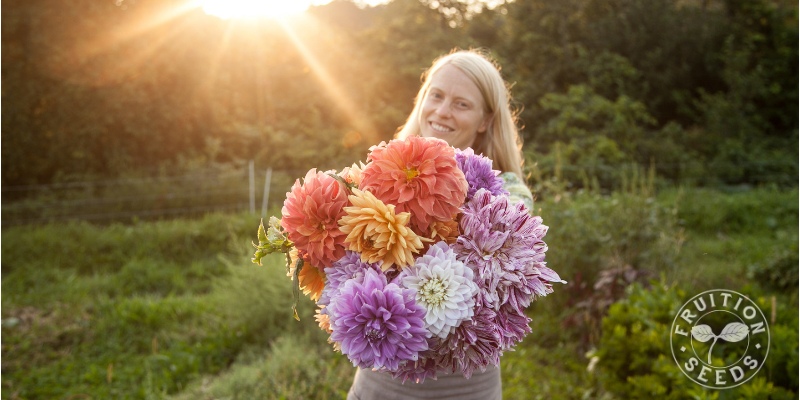 Storing your dahlias each season is a labor of love, there is no doubt about it. If you love plants, love process and have a few good tips (you're welcome!) 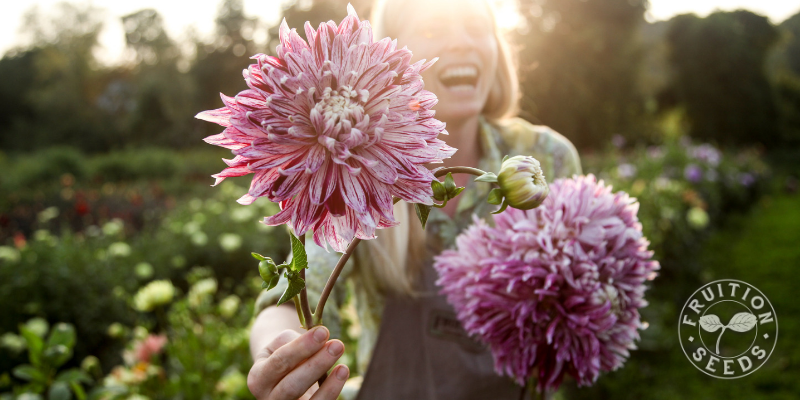 along the way, you're likely to love saving dahlias. 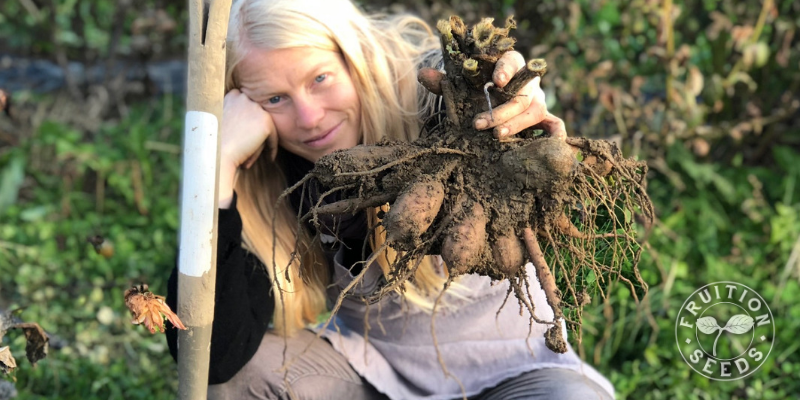 Saving your own tubers is also one of the most cost-effective ways to surround yourself and those you love with beauty for years to come.